Word cards, when matched make 140 pairs of compound words. 30 Sets of word cards and the contractions. 63 Triangle outlines for the Detective Adjective Game. 340 Labels for the Farm Game. 36 Pairs of logical adjectives. 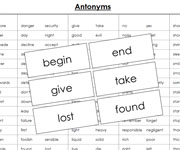 Word cards, when matched make 36 pairs of logical adverbs. 48 Pairs of masculine and feminine cards.